Got engaged over the holidays?! A big ole’ congrats is in order! This will hopefully be one of the most exciting times in your life filled with a pouring of love from all sides of your family and friends. It may also feel a bit overwhelming at times so this is where organization comes in to save the day. Getting and staying on top of your organization game will be a key component to rising above the stress and enjoying this wonderful time in your life! Planning a killer wedding that speaks true to you and your partner are as a couple and as individuals coming together requires some next level organizing. We asked the experts on what they think brides can do to stay organized while planning their wedding and especially the things to consider before getting started. It’s easy to want to dive right in with excitement at the all time high, but it’ll pay off in the long run to take a moment and get a bit organized. But how to get organized to plan your wedding? Well, we’ve got some great tips you’ll right here straight from the experts — professional wedding event planners. Top five tips to getting yourself organized before beginning to plan the big day. Create a clear vision of the big day. Make sure the most important people in your life are available before choosing the wedding date. Map out a realistic wedding budget. Figure out the must-haves with your fiancé. Decide on what kind of help you’ll be hiring. Read on and dive into each tip for details galore! 1. Create a clear vision of the big day. Katherine from A Frosted Affair — Denver’s Premier Wedding Planner — says that clarifying your vision for the big day is the first thing any bride should do. “Everyone is going to have an opinion about your wedding. Before you get family and friends involved, sit down with your fiancé and get a vision of how you want the wedding to feel. The who, how, and where of your wedding plans will all stem from how you want your wedding to feel so it’s critical to get very clear on this. Do you want it to feel like a joyous, vibrant celebration? A warm, private, intimate affair? Maybe you want it to feel like a big family reunion with lots of personality. Write down your vision. Share it with your wedding planner or whoever is helping you with your wedding. As you begin to make event selections, check back with that vision to make sure that all the plans you make are in alignment with your heart’s true desire. Why Start With Your Vision? Once you start planning your wedding, you will quickly get swamped with managing details. As the people around you start to weigh in on what they think and what they want, you will find yourself sorting through a lot of priorities. 2. Make sure the most important people in your life are available before choosing the wedding date. Meghan from DC Engaged suggests you reach out to ‘key players’ — those people in your life that absolutely must attend the big day before you choose the date — and set up a clear budget before moving forward with any planning. “Reach out to key players to find out if they have any blackout dates for your wedding and generally gain awareness of those key players limitations. One of the early steps in the planning process will involve choosing a wedding date and location. You want to make sure that you can get your nearest and dearest to that location on your wedding date. 3. Map out a realistic wedding budget. Meghan from DE Engaged also advises to start with a realistic budget. 4. Figure out the must-haves with your fiancé. Daulton with The Refined Host, suggests you sit down with your significant other and map out your dream wedding and match ideas. 5. Decide on what kind of help you’ll be hiring. Daulton also suggests if you’re going to hire a planner to do it before securing a venue. There you have it — five great tips to keep your about as organized as one can while the bubbly never seems to stop. The life of the engaged truly is a magical time, don’t forget to stop and smell the roses (especially if you’re planning on using these for your wedding) every now and then. This time may seem incredibly hectic and sometimes a bit stressful, remember that being a bride [and groom] is *your time to soak in all the love that’s likely pouring in from all sides of your family! But before you go, we’ve got two additional tips to help you stay on top of your organization-wedding-planning-game. Use online tools and resources to help. 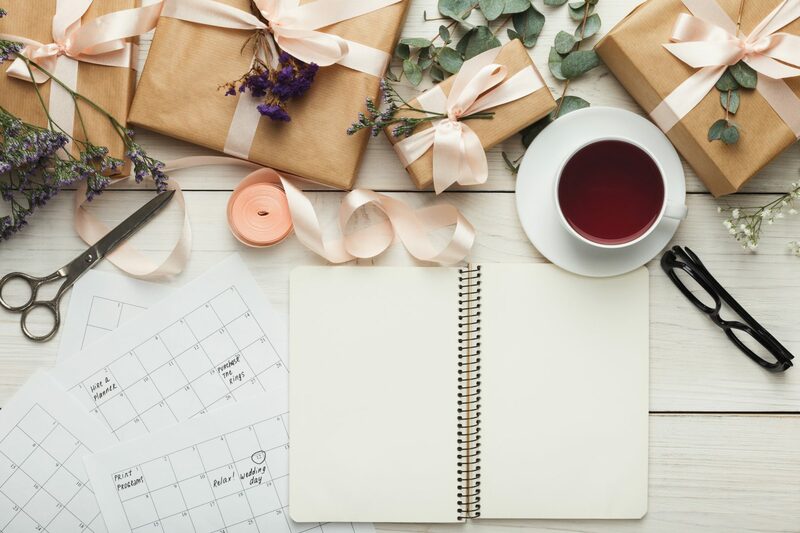 Keep a running list of wedding gifts as they pour in — note down who gave what as soon as you get a gift to make writing thank you notes later a total breeze. You’re a superhero — true — but even superheroes need assistance. There are a ton of great wedding planning apps out there. And we are one! Need wedding guests mailing addresses to mail out your Save the Dates & Wedding Invites? Don’t stress, collect them in minutes with Postable’s free wedding address book. Easily collect, organize and maintain your wedding guests’ mailing addresses. On that note, make sending out your Save the Dates (and wedding invites) the easiest part of your planning. Use Postable to mail them all out in 5 minutes (we’ll print, address and mail them all out for you). So basically, all of your wedding mail tasks can be achieved in minutes. Keep track of who gave what to make thank you notes easy. As gifts begin to pour in (and they will) jot down who gave what. This will make writing your wedding thank you notes that much easier. If you’re using the free wedding address book, you can use the notes section for each person to jot down what they’ve given you. Refer back to this list when you begin to write your thank yous so that you can be sure and thank each person for exactly what they gifted you. That about does it. Now go get yourself all organized and what not so you can enjoy all that being engaged has to offer! Start here with your free wedding address book.